Check out today's pricing and retail availability for Don Nicanor Malbec. 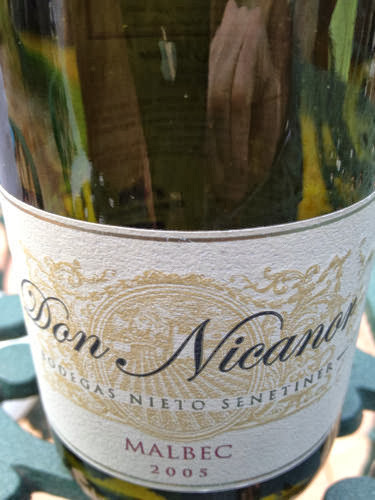 By way of background, opening thoughts: We tried the 2007 vintage of Don Nicanor in a blend at five years from vintage date and awarded three stars. Today, we're sampling an earlier vintage of pure malbec, 2005, at eight years from vintage date. Original tasting and review : This is Bodegas Nieto Senetiner Don Nicanor Malbec, Mendoza, Argentina, 2005, finished at 14% alcohol. f inch in from the edge. On the nose: Poured at room temperature and swirled vigorously, shows soft, yielding, bold and black squid ink aromas. From these, seems like this will be intense, flavorful and layered with black, black fruit. On the palate: The primary elements on the palate are in fact thick, silty and rich as anticipated, but with more of an oak-aged red fruit style. Clean, long, sandy finish. In summary: Overall, rates three stars on the five-star Spirit of Wine scale, with an easy plus for longevity and flavorful intensity. Awesome best value.